'After 1920 women who occasionally wore men's clothing and those who passed as men began to socialize more openly in cafes and night clubs. In Chicago two night clubs, the Roselle Club, run by Eleanor Shelly, and the Twelve-thirty Club, run by Becky Blumfield, were closed by the police during the 1930s because "women in male attire were nightly patrons of the places". Many of the couples who frequented these clubs had been married to each other by a black minister on Chicago's South Side. In San Francisco, lesbians met at Mona's, where, it was said "Girls will be Boys"'. Source: San Francisco Lesbian and Gay History Project 'She Even Chewed Tobacco: A pictorial narrative of passing women in America' in 'Hidden from history: reclaiming the gay and lesbian past' by Martin B. Duberman, Martha Vicinus, George Chauncey (Meridian Books, 1989). 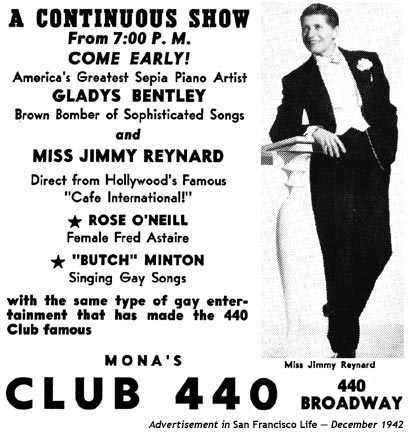 This advert mentions Gladys Bentley, described as "Brown Bomber of Sophisticated Songs" and "America's Greatest Sepia Piano Artist." 'Perhaps the most famous gay-oriented club of the era was Harry Hansberry's Clam House, a narrow, smoky speakeasy on 133rd Street. The Clam House featured Gladys Bentley, a 250- pound, masculine, darkskinned lesbian, who performed all night long in a white tuxedo and top hat. Bentley, a talented pianist with a magnificent, growling voice, was celebrated for inventing obscene Iyrics to popular contemporary melodies. Langston Hughes called her "an amazing exhibition of musical energy." Eslanda Robeson, wife of actor Paul Robeson, gushed to a friend, "Gladys Bentley is grand. I've heard her three nights, and will never be the same!" Schoolteacher Harold Jackman wrote to his friend Countee Cullen, "When Gladys sings 'St. James Infirmary,' it makes you weep your heart out."